Webhooks (also known as "Web Callbacks" or "Outbound Push Notifications") are sent by the BluSynergy systems when business events occur. These are typically used to when your applications need to be notified when various billing or payments related events occur. 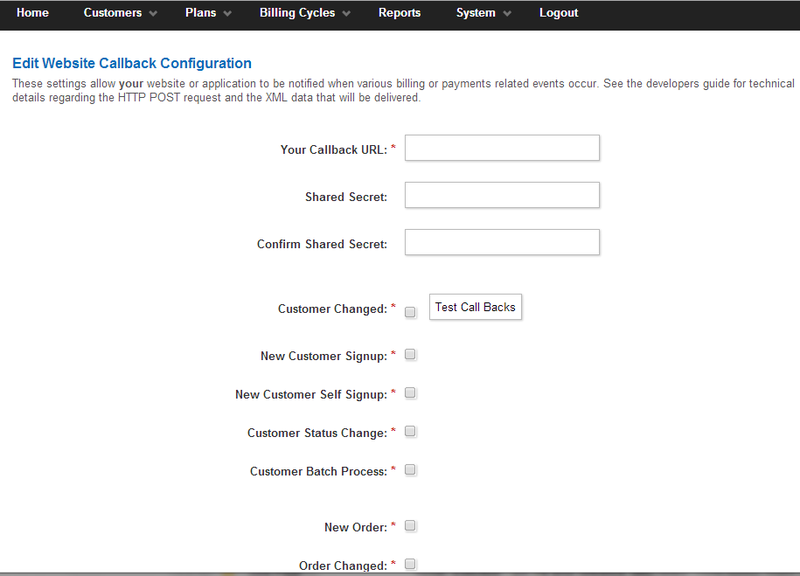 These settings may be configured from the [System >> Integration Settings >> Website Callbacks] menu (see the screenshot below). For example, let's say you'd like to automatically provision a user account in your application/systems when a new customer is created and you'd like to de-provision/suspend the account if a customer is delinquent. In this case, you'd select the "New Customer Signup" and the "Customer Status Change" events. Now, all subsequent customer signups and customer status changes will cause the BluSynergy system to initiate a Webhook (aka Callback / Push Notification) request to your system. If you have provided a shared secret, then it is sent in a custom HTTP HEADER field called 'X-BluSynergy-Secret'. We strongly recommend that you validate this field to ensure that the request has originated from the BluSynergy systems and is not a spoof. You may also use IP address validation as an additional security measure, please contact support to obtain the current list of IP addresses.